It is the next generation, the sequel, to Lynn M. Strunk Realty, Inc., that was founded in 1985, by Lynn M. Strunk. Lynn M. Strunk Realty operated under a name brand franchise for the last 30 years. Much of our initial success can be attributed to that affiliation. 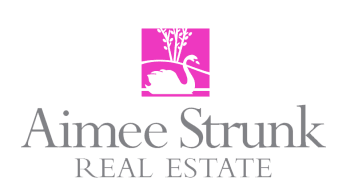 In the next chapter of our business, Aimee Strunk Real Estate, we are excited to combine technology of today, along with the strong foundation of personal affiliations. "Personally, I feel blessed to have had such a wonderful mentor in my mom, Lynn Strunk, who taught me that relationships really do matter more than the "sale." The relationships are what keep you in the game a long time. I also feel fortunate to have started my career in real estate, when the internet had yet to make such a powerful impact. I have seen exciting changes and embrace the technology. I am looking forward to continue what my mother began, with a combination of the best tools she had in her day - PERSONAL CONTACTS - along with today's best in technology. As an educator in the field of Real Estate for over 10 years now, I am passionate about consumer awareness. Smart, informed, choices, lead to happy outcomes.